Borrow kid-friendly cookbooks from the library or search online for recipes. Have them check flyers for healthier foods on sale, help write the grocery list, check the fridge and cupboards, or put together a folder of favourite recipes. Cook with a friend for a fun play date. Have a cooking party for kids. 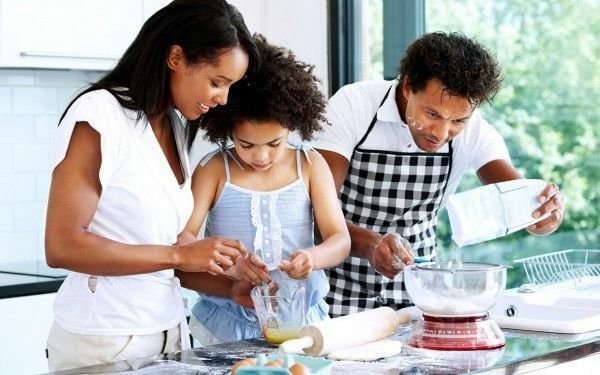 Let them plan the menu, write the grocery list, shop for food and cook the meal, with your help of course! Explore different ways to prepare food. For example, carrots can be eaten raw, steamed, or roasted. Get creative with pizza night. Let everyone make their own mini pizzas by choosing colourful toppings like pineapple, red peppers, and broccoli. Make healthy snacks for family movie night. Flavour popcorn with oregano, cinnamon, or grated Parmesan. Let your kids invent a smoothie. Blend Greek yogurt or lower-fat milk with fresh or frozen fruit for a delicious and healthy treat. Feed your kids’ curiosity by asking them to choose a new whole grain, such as brown rice, barley or quinoa to make together. Get your kids excited about trying fresh herbs. Grow parsley, basil, oregano and chives and use them in your meals.